What’s square, colorful, and comes in a pack of two? Okay, you might have thought Post-Its, but we’re talking about Logitech’s new Pop Home Switch: stylish, three-function smart switches that bring a welcome touch of simplicity to smart-home control. They'll be available soon in a two-unit starter pack with a plug-in receiver for $100 and individually for $40 each. The Pop Home Switch is compatible with a host of smart-home products from manufacturers including Lifx, Phillips Hue, Lutron, WeMo, and Insteon. You can also use them to control a Sonos playlist and to interact with Logitech’s own Harmony line of univeral remote control hubs. The switches are available in colors we’re calling putty, aqua, medium gray, and salmon (Logitech calls them white, teal, alloy, and coral respectively). 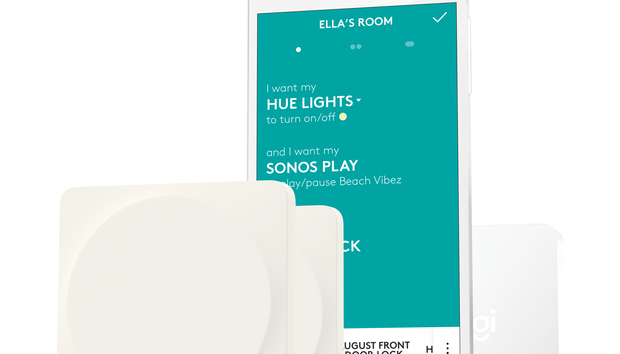 You interact with the Pop Home Switch in the same familiar way you'd use a mouse or a touchscreen: You can click, double-click, and click-to-hold to invoke "scenes" in your smart-home system. You might click once to turn on all your lights, for instance, double-click to dim the lights for date night, or click-and-hold to set the waterbed slowly spinning while mood music plays in the background. Sorry. Austin Powers flashback. The Logitech Pop Home Switch in aqua. In my brief demo with Logitech, the switches performed as advertised. I was struck by their pleasant tactile feedback, and the simplicity of control they bring to your setup carries over in the design of the Android and iOS apps. First impression: Elegant stuff, and not ridiculously pricey. Logitech says its Pop Home Switches will be available in August. Yes, it’s already August, so we’re figuring in a week or two. You can pre-order them now from Amazon or Logitech.